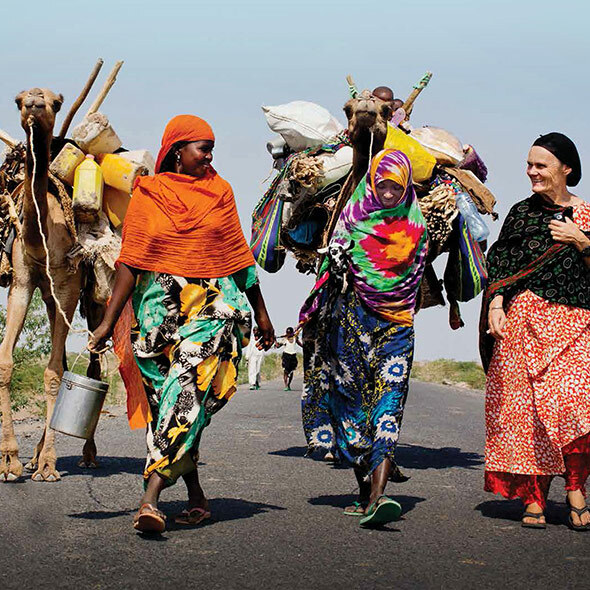 The Afar region of Ethiopia is one of the toughest places in the world to live. It has some of the hottest inhabited places on Earth – some areas exceed 50 degrees Celsius in the hot season. The Afar people, who are primarily Islamic, live a traditional semi-nomadic lifestyle, moving their goat and camel herds in search of feed. As climate change increases the frequency and severity of drought, this fragile lifestyle becomes even more difficult. Australian nurse Valerie Browning first went to Ethiopia in 1973. In 1989 she married Ismael Ali Gordo, an Afar leader, and since then has been living with and serving the Afar people. In 1993 she and Ismael joined with other leaders to form the Afar Pastoralist Development Association (APDA); 22 years later, APDA is still run by and for the Afar people. Anglican Overseas Aid has been partnering with Valerie Browning and APDA since 1997, working on long-term development programs along with emergency relief, including helping to restock goat herds that died in the 2012 East Africa food crisis (watch a video about that response here). Valerie and her Afar colleagues are committed to helping in hard places where many people will not go, and we are committed to supporting their work.